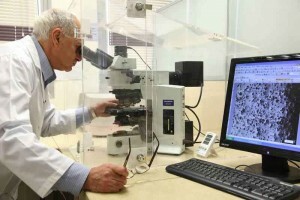 In the framework of further expanding its commitment in the polymer films industry, Tosaf (www.tosaf.com), a leading international manufacturer of high-quality compounds, additives and masterbatches, has now completed a substantial expansion of its production simulation labs in Israel. New and enhanced state-of-the-art laboratory systems now allow a full range of basic developmental and customer-specific test runs. The versatile set of test and simulation devices includes a multilayer co-extrusion blown film line, a cast film line, a corona surface treatment system and a printing simulator. A cold chamber supports the development of advanced additives for cold climate environment. With a newly installed, modified QUV system, Tosaf is responding to increasing customer demand for results from accelerated weathering in aggressive environments. A specialized greenhouse simulation is dedicated to the accelerated testing of agricultural films exposed to UV light, high temperatures and humidity. Tosaf Group, founded in 1985, is a jointventure between Megides Holding and the Ravago Group, with an expected turnover of more than EUR 300 million in 2013. The group operates nine factories in Israel, Turkey, Germany, UK, The Netherlands and the Ukraine, with a total of 800 employees. Tosaf’s versatile range of products includes mineral-filled compounds for the white goods industry, automotive and other plastic industries; additives such as UV/light stabilizers, flame retardants and customized additives for applications including BOPP, agricultural, packaging and industrial films, polycarbonate sheets, pipes, foams, as well as colour masterbatches for a wide range of applications.